U.S. Flag Store's Kentucky State Flag is printed in America on Nylon flag fabric. Since this flag is made in America, U.S. Flag Store is able to ensure that the complex State emblems are printed with accuracy, sharp detail and bright colors. This outdoor Kentucky State Flag is finished with the same high quality materials as all of U.S. Flag Store's US flags, and is extremely durable and long lasting. Design: A blue flag with the Kentucky state seal placed in the center. Placed below the seal are two overlapping goldenrod flowers, which is the Kentucky state flower. Meaning: The two men, a pioneer and a statesman, are depicted shaking hands in order to represent Americans that are enacting the states motto "United We Stand, Divided We Fall". In the early days of Kentucky's history the territory that is now a U.S. state flew many different flags for the various counties and people that settled the area. Before the French and Indian War a part of the Kentucky territory belonged to the French Monarch, but after the war the land went to Great Britain and flew the Union Jack over the land. After the American Revolutionary War, the land became a Commonwealth of Virginia and flew the Virginia flag over what is now the state of Kentucky. In 1792 Kentucky became a U.S. state of the Union and adopted the 15-star American Flag as an unofficial state flag. Throughout the American Civil War, Kentucky (a border state) flew both the Confederate and Union flags. Finally, In 1918 an official Kentucky flag was created. 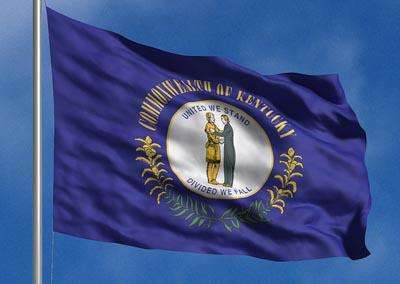 Jesse Cox Burgess, an art teacher in Frankfort, designed the flag and the Kentucky General Assembly officially adopted the flag on March 26th. The Great Seal of Kentucky was accepted by the Kentucky General Assembly on December 20th, 1792. John Brown, the first senator of Kentucky, said the seal was meant to depict, "...two friends, in hunter's garb, their right hands clasped, their left resting on each other's shoulders, their feed on the verge of a precipice." This design was a literal illustration of the state's motto, which when translated said, "United We Stand, Divided We Fall."